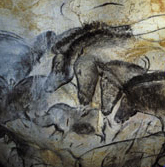 Some of the most glorious works of art ever painted were done 25,000 to 40,000 years ago on cave walls in southern France and northern Spain. These paintings have puzzled anthropologists ever since their discovery 40 years ago. The paintings display astonishing degrees of talent and depict strange arrays of bison, horses, and part animal part man creatures known as therianthropes. Many anthropologists claim that the works of art were done by shamans under a trance-like state. These trances were most likely brought on by psilocybin, which is a psychoactive ingredient found in certain mushrooms. If it is indeed true that these paintings were done under altered states of consciousness, then it is the first visible encounter with the supernatural and the first expression of spiritual myth, making it a defining point in human history.